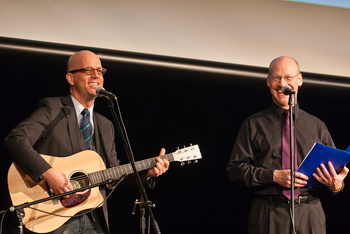 I’ve known the skeptic, musician, and bepated bon vivant podcaster George Hrab for many years now, and it is truly an honor to call him my friend. He’s smart, wise, a natty dresser, and very, very funny. His music is brilliant, which you already know if you’ve heard it. And hey! Here’s your chance now: Geo’s throwing a concert! He’s calling it “21812, A Gneiss Night Out”, and it’ll be on February 18, 2012 (hence the name) and it will be in Bethlehem, Pennsylvania. But he’s had concerts before, I hear you thinking. What’s so special about this one? Well, for one thing, he’s recording it so he can release a complete DVD of the whole thing, which is pretty cool. And for another, he has invited a special guest, someone so amazing and awesome that no one could possibly resist buying tickets! Sadly though that person couldn’t come so he invited me instead. That’s right! I’ll be there (w00t!) and we’ll be doing his song “Death from the Skies” (based on my book) live on stage. If you have no clue what I’m talking about, perhaps this will help. This song will change your life, or at least make you cringe for fear of it. This concert will be epic. Seriously legendary. Tickets are on sale now. You should come. I’d love to see lots of BABloggees there!